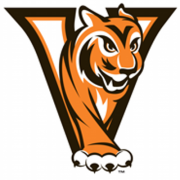 Last season, there were many questions about the Valley Tigers. As the season went on, Coach Gary Swenson started receiving the answers to his questions. It’s safe to say that after the Tigers 10-2 campaign in 2014, Swenson has no questions to ponder about. Behind an offensive line anchored by Division I prospect OL John Rairdon, OL Sam Rodgers and TE John Gliniecki, junior quarterback Rocky Lombardi is more than ready to lead the Tigers into the 2015 season. Lombardi emerged as one of the top signal callers in 4A as a sophomore. Lombardi completed nearly 58% of his passes (122-211, 2097 yds, 21 TD’s 7 INT’s). Jevon Mason will be the featured running back for the Tigers, replacing Drew Gray. The sophomore Mason rushed 404 yards and 4 touchdowns as a freshman last season. TE John Gliniecki is the Tigers’ returning receiver and the most seasoned. He pulled down 10 catches for 271 yards in 2014. Gliniecki will be asked to step in to replace Dominique Dafney, Austin Hronich, and Blake Salsbury, who have graduated. Linebackers Nick Yencer and Ben Campos will lead a stingy defense with ball-hawking DBs Turner Scott and Noah Barr who combined for 5 interceptions. Facts and info: Valley’s two losses were to Waukee. The Tigers lost to Waukee in Week 1 and in the quarterfinal round of the 2014 playoffs. 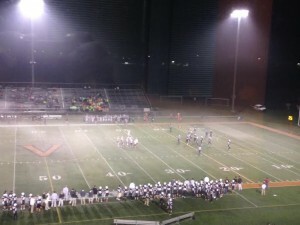 Action during the third quarter of the Lincoln vs Valley football game, as the fog started to roll in. Many coaches will tell you stats don’t matter, but they know wins and player development are part of the job. But when a running back is just short of a 1,000 yards for the season, there is a little incentive to break that milestone. Senior running back Drew Gray was 100 yards shy of hitting 1,000 yards heading into this evening’s game against Lincoln. Gray needed only two series to break that threshold, scoring on the Tigers’ first two drives, en route to a 62-0 win at Valley Stadium Friday night. Gray capped a 6-play, 72 yard drive, with a 6-yard touchdown run, and would add a 4 yard score on the next drive. Gray would finish the night with 12 carries for 147 yards. Freshmen Javon Mason continued to turn heads with a 5 carry 38 yard night, with 29 of them coming on one play. In the second quarter, Mr. Versatility, Blake Salsbury, would add a running and receiving touchdown to push the Tigers’ lead to 28-0. In a night featuring two underclassmen quarterbacks, the elder Rocky Lombardi (10-13, 242 yards) shined brighter, tossing three straight touchdown passes, two to Dominique Dafney (6 rec, 160 yards) and one to Salsbury as Valley took a 49-0 lead into halftime. Lincoln was able to move the ball in the second half, but freshmen Will McElvain’s (20-38, 3 interceptions, 207 yards) pass was intercepted by the Tigers’ Turner Scott, and he weaves 80 yards for a pick-six. The Tigers ended the scoring with a 3-yard touchdown run by Jake Griffiths. Valley finished with 555 total yards, 302 on the ground. Darius Shumpert carried the ball 23 times for 80 yards and hauled in 8 receptions for 93 yards. Logan Garrels, fresh from a record performance versus Hoover last week, made 8 catches for 90 yards. Lincoln finishes the season at 3-6, as Valley completes the season 8-1 and District 1 champions. Valley will learn of their 1st round opponent early Saturday morning. Central Iowa Sports Network will provide audio only coverage of the Valley Tigers’ beginning Wednesday night, starting a 6:50 pm on CentralIowaSportsNetwork.com. Paul Yeager, Dar Danielsen, and Keith Borness, and Jim Kirby will have the call. The Lincoln Railsplitters are riding high after last week’s mild upset of Hoover, putting the Huskies in a must-win mode. Lincoln’s also in a mostly must-win mode, if they want to be in the playoffs. Lincoln could improve their chances to get into the playoffs with another upset…against the Valley Tigers. This sets the stage for the regular season finale of your CenturyLink Game of the Week on CISN. Freshman Will McElvain leads the Rails at quarterback. McElvain has thrown for 740 total yards for the Rails (3-5, 2-2). Running back Darius Shumpert and wide receiver Logan Garrels are McElvain’s go-to guys. Garrels (59-806, 6 touchdowns) had a big hand in Lincoln’s big 49-35 win over Hoover last week, hauling in a 97 yard touchdown reception that broke the game open. 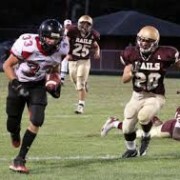 Garrels also set a set state record with 340 receiving yard night. Linebackers Wade Gillum and Marco Foster have nearly 70 tackles between them for the defense, with strong safety Bryan Richter adding 23.5 tackles as well. 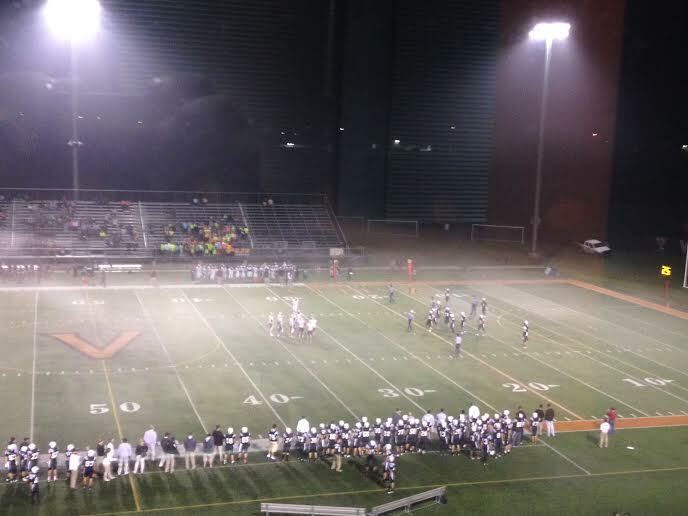 Valley (7-1, 4-0) closed out their road portion of the season with a 28-3 win over Ankeny Centennial. After a close 7-3 game heading into the fourth quarter, Valley pulled away with crucial plays including blocking two Centennial field goals and a 51-yard touchdown strike from Rocky Lombardi to Blake Salsbury. The Tigers will be celebrating Senior Night, as they honor 30 players. Can Lincoln crash the party and punch their ticket to the playoffs, or will Valley put away Lincoln early and often? The Facts: Lincoln defeated Hoover 49-35, while Valley upended Ankeny Centennial 28-3. The last time these teams met was October 11 2013. Valley won 35-14. Will there be a hangover for Valley after winning the district title? Will Lincoln find a way to keep pace with the Tigers? Are the Tigers at full strength for the playoff run or on cruise control with the second season looming? Lincoln will be starting 4 freshmen on offense. How will they handle Valley’s defense? Our live pregame show on the Central Iowa Sports Network (centraliowasportsnetwork.com) will begin at 7 pm, with kickoff at 7:30 pm. Join Paul Yeager, Keith Borness, and Taylor Bennett for the call of the game. Jim Kirby will be your sideline reporter. Follow us on Twitter @CISportsNet for updates throughout the game. The Scheels Audio Game of the Week will have Dar Danielson with the call of Fort Dodge visiting Urbandale at Frerichs Field. As an added bonus, High School Cube and QC Sports Net will have links and streams to all of the games across the state. The West Des Moines Valley Tigers do not believe in taking an opponent for granted. They should know…everyone wants to take their best shot at them. The Tigers (6-1 overall, 3-0 district) carried that mindset onto the field against Sioux City West and cruised to a 76-6 win over the winless Wolverines (0-7, 0-3) Friday evening. 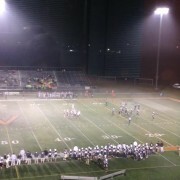 Valley went three-and-out on their first possession. It was the only time they would punt in the game. On West’s first drive, Valley’s Zach Grasso stepped in front of a Ricardo Quintana pass and rumbles in for a 46 yard touchdown with 9:38 left in the first quarter. Valley would score on their next eight drives before the first half was over. Drew Gray took a Rocky Lombardi hand-off for a 22 yard score to make it 14-0. Gray would add two more touchdowns (from 3 and 6 yards) on the next two drives, and then Rocky Lombardi (5-11-0 111 yds, 2 touchdowns) threw a 44-yard strike to Austin Hronich to push the lead to 35-0 after the first quarter. In the second quarter, fullback Blake Salsbury got into the act with two scores of his own, a one yard dive into the end zone at 10:32 of the second quarter, and an 11 yard scamper four minutes later. Lombardi would connect with Dominique Dafney for a 27 yard touchdown and Javon Mason would tack on one final touchdown from 10 yards to make it a 62-0 lead at the half. Drew Gray would finish with 12 carries for 90 yards, while Dafney had 5 receptions for 67 yards. The lone bright spot for the Wolverines took place with 1:31 left in the third quarter when Noah McWell threw a 17 yard pass to Richardo Quintana for a touchdown. The extra point was blocked. It was the sixth touchdown of the season for West. McWell, who started at running back but also plays quarterback, was 12-16 for 108 yards, while Quintana was 7-12 for 17 yards. West was unable to gain traction in the ground game, totaling 22 yards on 32 rushing attempts. Jalen Roseland hauled in eight catches for 82 yards, most of it against the Valley defensive reserves. Next week, Valley will head to Ankeny to take on the Centennial Jaguars (6-1, 3-0), while West will host Council Bluffs Abe Lincoln (3-4, 1-2) in a Thursday night contest. Dominique Dafney wanted to make a statement. He wrote “Beat Dowling” on his shirt, wristband and anything else that would hold ink. The senior wide receiver from Valley had the game of his career with 10 catches and 141 yards and two TDs. But it was his catches in the clutch that helped the Tigers pull the upset over top-ranked Dowling Catholic. The 24-21 win is the Tigers’ first over the Maroons since 2012. Rocky Lombardi and Dominique Dafney was the 1-2 punch that the Tigers needed to snap the Maroons’ 17-game winning streak. Lombardi passed for 15-28 for 206 yards and two touchdown strikes to Dafney. 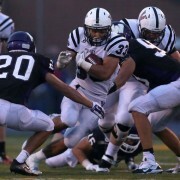 Drew Gray grinded up the Dowling defense with 97 yards on 32 carries. After a Gabe Honnold 27-yd field goal to take a 3-0 lead, the Tigers recovered a kick off return fumble and capitalized 2 plays later with when Lombardi found Dafney for a 20-yard scoring strike for a 10-0 lead. Dowling closed the gap to 10-7 on a Ryan Boyle to Charlie Schulte 29-yard touchdown pass. Rocky Lombardi found Dominique Dafney again for an 8-yard scoring pass. With 38 seconds left before halftime, Boyle forced a pass and it was intercepted by Noah Barr and Barr weaves his way for a 38-yard touchdown as Valley went into the half with a 24-7 lead. Dowling crawled back into the contest as Boyle plunged into the end zone from 1 yard out to make it 24-14, with 8:34 left in the game. After forcing a three-and-out, Dowling hit paydirt once again with another Boyle 2 yard quaterback sneak. That drive was set up by a 42 yard pass play from Boyle (10-20, 138, 1 TD, 2 INT) to Schulte. But when the Tigers needed to keep a drive going, it was Dafney who made a catch on 4th and 11 to extend the drive and ice the game away. “It was an awesome win for the kids,” said coach Gary Swenson after the game. The Tigers open District play at Des Moines Hoover. The Maroons will host Council Bluffs Lewis Central in district play next Friday. When two teams meet in a rivalry, it’s more than “a game.” It’s families, friends, neighborhoods, and a community divided…in the name of loyalty, tradition, and support. On Friday, one rivalry will be renewed, with bigger stakes than city pride. The #8 Valley Tigers and the #1 Dowling Catholic Maroons will lock horns for the 65th time as our CISN CenturyLink Game of the Week. And for the Tigers, it is Homecoming. After a season-opening loss, Valley has rebounded with two resounding wins. Quarterback Rocky Lombardi, running back Drew Gray and Dominique Dafney provided the triple punch for the Tigers on offense. Last week against Southeast Polk, Lombardi was 14-19 for 266 yards passing for three touchdowns, all of them to Dafney. Gray pummeled the Rams’ defense for 161 yards on 23 carries. Valley’s defense surrendered 38 rushing yards to SE Polk in a 42-14 win. Dowling turned their #1 vs #2 showdown against Waukee last week into a rout. Quarterback Ryan Boyle accounted for 5 of the Maroons’ touchdowns and the defense shut down a Waukee offense to a mind boggling 32 yards, 15 of those from coming from All-State running back Trevor Allen. Boyle passed for 169 yards and rushed for 152 as Dowling bolted to a 28-0 first quarter lead en route to a 45-14 win. Can Valley do what no one hasn’t done since 2012 and take down the undefeated Maroons? Can the Tigers avenge the semi-final playoff loss in the UNI-Dome to end last season? 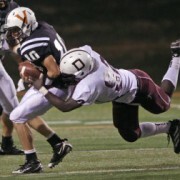 The Facts: Dowling routed Waukee, 45-14 last week. Valley defeated SE Polk, 42-14. Dowling leads the series, 38-26, including playoffs since it became an annual rivalry in 1968. 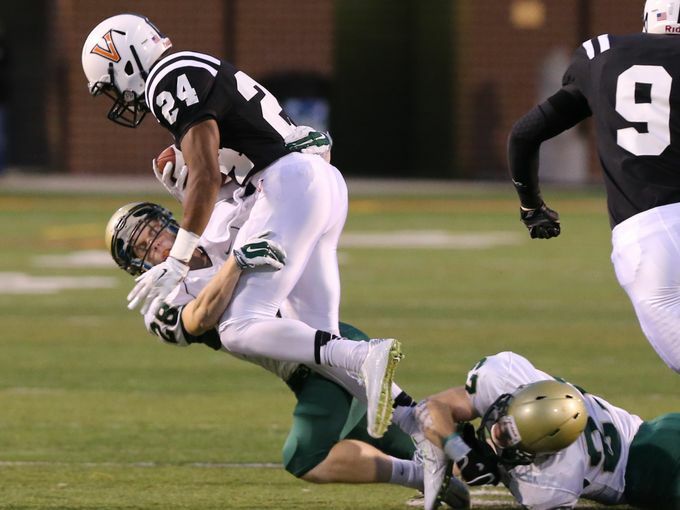 Will Dowling’s defense shut down Valley’s Lombardi, Gray, and Dafney? Will Ryan Boyle put on another super-human like performance? How will Valley’s 7 Sophs perform in their first rivalry game? Can the Maroons improve upon a stellar 1st Quarter of last week? The live pregame show will begin at 7pm, with kickoff to follow on Central Iowa Sports Network (centraliowasportsnetwork.com). Join Paul Yeager, Keith Borness for the call of the game. Jim Kirby will cover the Dowling sideline and Jesse Gavin will be on the Valley side of the field. Follow us on Twitter @CISportsNet for in-game updates. Our Audio Game of the Week, presented by Scheels, will have Ankeny Centennial (3-0) hosting Southeast Polk (0-3), with Dar Danielson with the play-by-play. As an added bonus, our partners at High School Cube will have the live online stream of other area games of interest. The featured game will be Johnston and Waukee. Plus we’ll be offering links to games in eastern Iowa as well through QC Sports Net. ICW will have the ball on their own 46, 3rd and 8. Bleil pass to Koch is complete. Gain of 13 for 1st down. 1/10, V43: Bleil handoff to Dowell. Tackle by Vertin. Gain of 5. 2/10, V43: Bleil pass to Doyle, gain of 19. 1/10, V24, ICW fumbles ball, Valley recovers. Valley start drive on own 21. 1/10, V21, Gray run, gain of 11, for first down. 1/10, V35: Gray run, fumbled, recovered by Valley. maintain possession. 2/8, V37: Lombardi sacked by Milani, loss of 7. 3/15, V30: Lombardi scrambles up field, gain of 14. 1/10, V48: Gray run, cuts up field, Milani trips him up, gain of 19. 1/10, W29: Lombardi fakes handoff and runs for a first down, tackle by Adcock, gain of 20. City West ball to start drive on own 16. Tyler Eads KO return, tackled at W27. 3/11, W26: Bleil pass incomplete. Penalty on play. 1/10, W20: Timeout, ICW. Eads run, tackled out of bounds. PF-Valley. Gain of 5, tack on 15. 1/15, W35: Dowell run, gain of 1. 2/13, W37: Bleil pass to Martin complete, gain of 21. 1/10, V42: Bleil sacked by Walsh. Loss of 6. 3/18, V49: Bleil pass caught by Eads, but out of bounds. Incomplete. 4/18, V49: ICW punts. Dafney with punt ret. Penalty on play. Holding against Valley. 2/10, V42: Penalty on play. Penalty on Tigers. 3/15, V37: Gray run, tackle by Koch, gain of 19. Timeout Valley. :50 left before halftime. 2/10, W44: pass inc. Penalty, illegal receiver down field on Valley. START OF THE 2ND HALF. CITY WEST BALL ON OWN 22. 3/11, V41: Bleil scrambles down sideline. Penalty on ICW. 1/10 V39: Gray tackled behind line of scrimmage. Penalty on play. Offsetting PFs. 2/15 W21: Penalty, defensive offsides, Valley. 4/8 W29: City West punts. 3/G, W11: Lombardi pass to Quinton Curry incomplete. Start of 4th Quarter: City West ball on own 46. 3/8 V30: Bleil pass to Martin complete, gain of 5. 2/3 V9: Bleil pass incomplete, penalty on Valley – DPI. Last week, one team got a last-minute win…the other team was outplayed. On Friday, one team looks to shrug off a slow start, and one team looks to even up their record with some home cooking. Your Century Link Game of the Week this Friday returns to Valley Stadium as Iowa City West (1-0) faces West Des Moines Valley (0-1) in another big Class 4A east vs. west non-district showdown. Valley opened the season at Waukee. Though both teams mirrored each other statistically, two Tigers interceptions and mustering two field goals proved to be Valley’s undoing, falling to the Warriors, 28-6. In his first start at quarterback, Rocky Lombardi completed 13 of 24 pass attempts for 154 yards and was picked off once. Returning starting running back Drew Gray shouldered the rushing game load for 16 carries for 117 yards, and wide receiver Dominique Dafney hauled in 8 catches for 86 yards, even after an awkward landing after a catch on his neck. The Trojans of Iowa City West, on the other hand, were on their way to losing their home opener to Cedar Rapids Kennedy. With 1:59 left in regulation, West quarterback Aaron Bleil’s 4th-and-15 pass to Gabe Huniker for a 33-yard touchdown gave the Trojans a 12-9 win over the Cougars. Bleil was 15-31 for 201 yards and had a rushing touchdown in the Trojans first score of the night. Oliver Martin caught 7 receptions for 106 yards to spark the West offense, as the rushing game sputtered. The Facts: Iowa City West escaped with a 12-9 win over Cedar Rapids Kennedy, after a 4th down touchdown pass from Aaron Bleil to Gabe Huniker. Valley fell to Waukee, 28-6, only mustering two field goals and having two passes intercepted by Waukee’s defense. Will West mix up their defense to confuse Valley QB Rocky Lombardi? Can the Trojans play all 4 quarters? Will Valley’s sophomores step up and make a difference? Will the injuries hamper the Tigers? We will have a live blog of the game (Twitter hashtag #CISNliveblog). Check in to see any story lines develop and stats as they become available, and we’ll keep you updated on other happenings as the night progresses. Our Audio Game of the Week, presented by Scheels, will be Des Moines Roosevelt (1-0) @ Ankeny Centennial (1-0), with Dar Danielson doing the play-by-play on CISN. As an added bonus, our partners at High School Cube will have the live online stream of #2 Waukee (1-0) at Southeast Polk (0-1).